Can El Salvador's environment support megaprojects like Valle El Ángel? 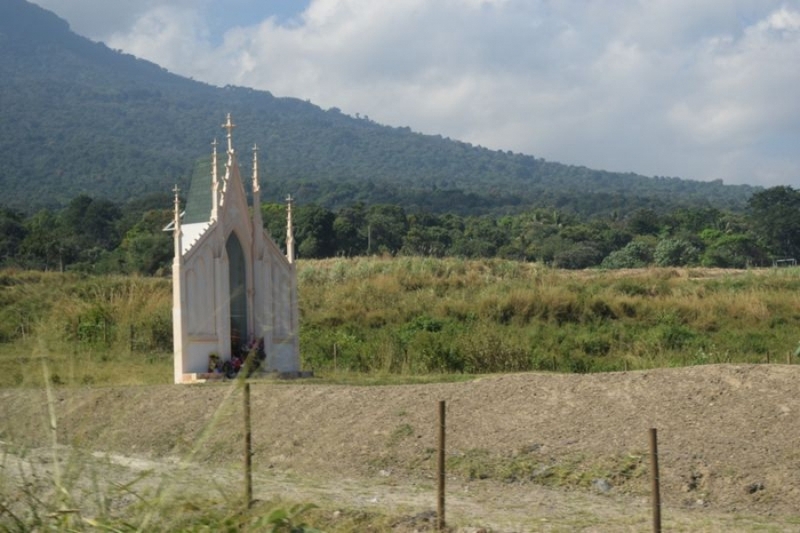 Religious and water rights groups organized today to protest a mega-real estate project in the municipality of Apopa, just northeast of San Salvador at the base of the San Salvador volcano. The proposed urbanization development of 8000 houses, shopping centers, churches and more threatens the available water resources in the region, according to the groups. The development is called "Valle El Ángel" and is a project of real estate developer Urbánica. Urbánica is a business of the wealthy Dueñas family in El Salvador. Currently the land, along the Pan-American highway, is primarily used to grow sugar cane. 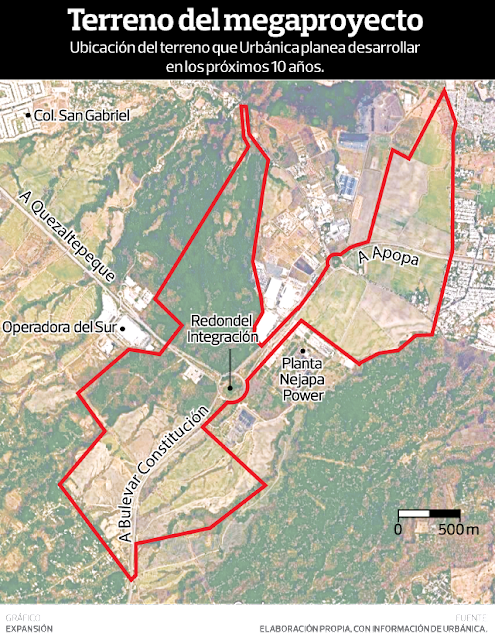 Urbánica last year described the development as a mixed-use small city consisting of 840 acres where it would build 6500 houses with a contemplated investment of $500 million over 20 years. The project was initially promoted with great fanfare in 2016 as the Dueñas family announced they had reached agreement with the water authority ANDA to allow them to drill 9 deep wells to provide water to the proposed development. Now in 2019, initial development in the area is commencing with the construction of religious facilities to anchor opposite ends of the project zone. At one end construction crews are already moving earth today for the construction of a spirituality center dedicated to the Virgin of Fatima including a 400 seat church, seminary and school as well as parking for more than 400 cars. The spirituality center is owned by a Roman Catholic association named "Heraldos del Evangelio" who indicate that the land was donated to them "by local businessmen." At the north end of the Valle El Ángel development is a complex for the evangelical Elim church. Elim is one of the largest mega-churches around, and the proposed facility will include a convention center, worship space, library, school and more. Sale of the property to Elim took place in 2007 according to the church. Plans to build the church were put on hold following the 2008 financial crisis. The church's website does talk of this being a "garden church" which will set aside ample land as environmental reserve. El Salvador's environment ministry (MARN) has granted environmental permits for both church projects. Alarmed by the arrival of large earth-moving equipment at the Virgin of Fatima site, concerned environmental groups filed a complaint with one of El Salvador's environment courts in Santa Tecla on March 14, 2019 seeking an injunction requiring more ample study of the environmental impacts of the projects encompaased within Valle El Angel and their impact on the region's hydric resources. According to the complaint, the underground aquifers in this zone are already being depleted faster than they can be replenished by the infiltration of annual rainwater. Additional exploitation of those aquifers through more deep wells along with reduced filtration of rainwater as a result of development with streets and parking lots and sidewalks, etc. threatens water resources for the metropolitan area. If the Dueñas plans to construct 8000 houses are carried out in full, the resulting drain on the aquifers would be 138 liters of water per second, deepening the crisis of storage of potable water in the greater San Salvador metropolitan area, according to the complaining groups. The groups are also challenging Urbánica's 2016 agreement with ANDA, asserting that ANDA had denied a permit to the Dueñas family to build a smaller project at the same site in 2009 on the basis of the inadequacy of water resources in the zone. Since 2009, the stress on water resources in the zone has only gotten worse, not better. Dueñas family real estate developments are known for proceeding in environmentally sensitive areas of metropolitan San Salvador around the volcano of the same name. On the opposite side of the city, Dueñas projects have forced local communities off their land and moved into undeveloped areas of El Espino, known as the "lungs of San Salvador" for its important forested areas. The protests today were drawn from water rights groups like the Foro del Agua, local Catholic parishes in the zone, the Tutela de Derechos Humanos office of the archdiocese of San Salvador, the University of Central America, the Salvadoran Lutheran church and others. The protesters emphasized that, if the Valle El Ángel mega project goes forward, there will be a greater scarcity of water, increased sewerage discharge, greater susceptibility of disasters from the volcano which looms over the sight, and increased traffic congestion. (For someone who regularly drives through this zone as I do, which is already at a standstill during rush hours, the idea of adding 8000 houses and religious centers is horrifying). This major struggle between locally organized environmental and religious groups and multi-millionaire developers raises important questions about how El Salvador will manage such conflicts going forward. President-elect Nayib Bukele has campaigned on bringing mega-projects to El Salvador. He has promoted such developments as a new international airport in the east, "Surf City" oceanfront resort development, a railroad, and more. In his speech to the Heritage Foundation in Washington,D.C. earlier in March, Bukele announced that the country was eager to do business with foreign investors and that his government would ensure a friendly legal framework for a profitable relationship. Such emphasis on development projects raises the question how environmental and social concerns, such as those present in Valle El Ángel, will be addressed. So far, it's clear that prior governments in El Salvador have not been willing or able to do much to ensure that water and environmental resources are protected or that the benefits of development projects are equitably distributed. An example from a few years back is the El Encanto golf and country club. The golf club extracts an enormous quantity of water in order to water the fairways and greens of the 18 hole course. While the water does not come from the local potable water system, it still represents an ostentatious use of water for a privileged few. Meanwhile, as this report and video from El Faro illustrate, neighboring communities continue to lack access to any potable water system, except for a tank truck which the golf course pays for to circulate among some local settlements pumping water into assorted plastic containers. When Bukele seeks to attract big, splashy projects, will his track record be any better? When a developer like Urbánica comes to town with promises of a $100 million mega-development, the temptation will be great to accede to whatever demands for accommodations are made. Proposed new developments will need to take into account the stress on water resources, will need to consider further environmental degradation in the country, and will need to consider the impact on surrounding communities. Impacts can be especially grave for communities in poverty in a country which is the most densely populated in the mainland Americas. The "Valley of the Angel" dispute features church environmental groups needing to challenge the development plans of other churches, as well as powerful real estate interests of one of the wealthiest of the "14 families" in El Salvador. This will be one of the first, but not the last, tests for a new president to see whether he can balance both economic and environmental concerns. Does El Encanto's water system have any negative impact on surrounding communities? I haven't been able to figure out if it actually affects the water for nearby communities.